November 15, 2002 The toasty fall days are giving way to cool rains and long shadows. The Cherokee crew has already cranked the woodstove a time or two, only to show up in short sleeves the next day in the fickle weather. 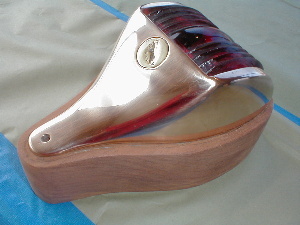 Jeanette’s been working on the running lights, sanding and polishing the original Huckins pieces. 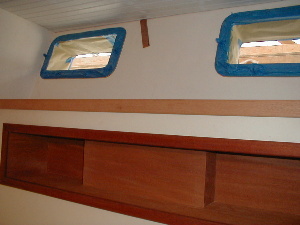 Chris built mahagony bookshelves for the aft guest stateroom, and Bill, Kerry and Jeremy have sanded them and applied beaucoup layers of varnish. 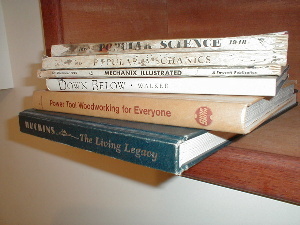 Note the Popular Science magazine on the shelf, published in 1948 – same year Cherokee was built. Below left is the mahagony countertop that Tom Parker built for the bar, temporarily fitted in place on the right. 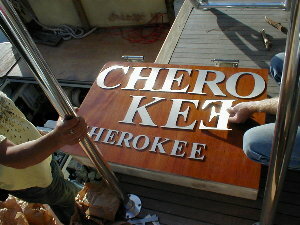 This is located in the aft starboard corner of the pilothouse. 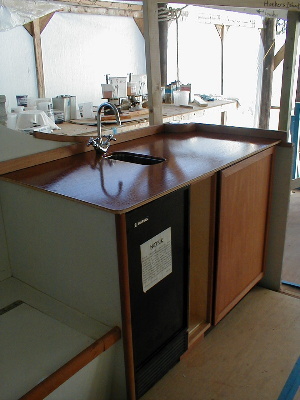 Incorporated in the wetbar are a refrigerator, icemaker, storage cabinet, and a structural aluminum member that will help in the support of the hardtop. Leonard is tabbing in the hardtop to the windshield. Six layers of glass tape were placed inside and outside creating two continuous fiberglass structural angles. 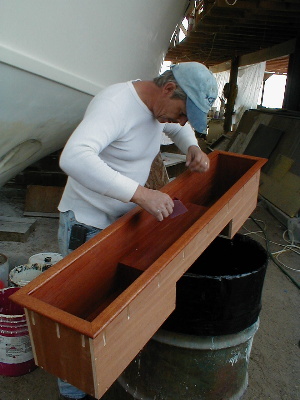 This helps stiffen and tie together the windshield and pilothouse sides, as well as creating a six-inch wide gluing surface that the hardtop sits on. 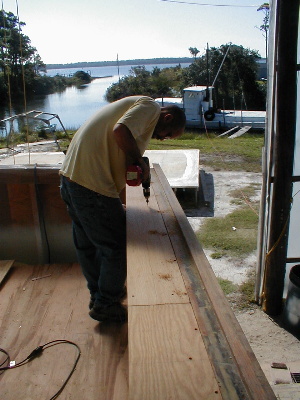 Above, Chris is building a substrate out of 3/4 inch plywood for the teak covering boards. 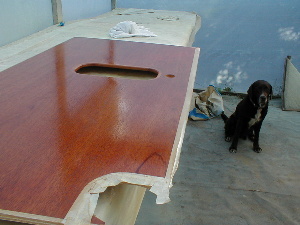 The boards will be glued to this surface, allowing the elimination of finger beams and leaving space to store a boat hook or gaff below. 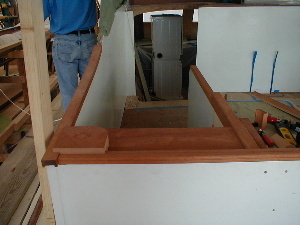 To the right, pictured in the aft port corner of the pilothouse, is a mahogony piece that covers the aluminum structure that the hardtop support will sit on. This will be a two-inch aluminum pipe that will take the load off the large amount of glass in the rear of the pilothouse. 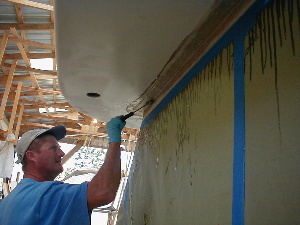 Below, Tom’s gluing together air conditioning duct out of Divinycell. This is part of the heating and a.c. system in the master stateroom.